I love low maintenance curls that give maximum impact. I also love low maintenance regimes that provide maximum results and volume! 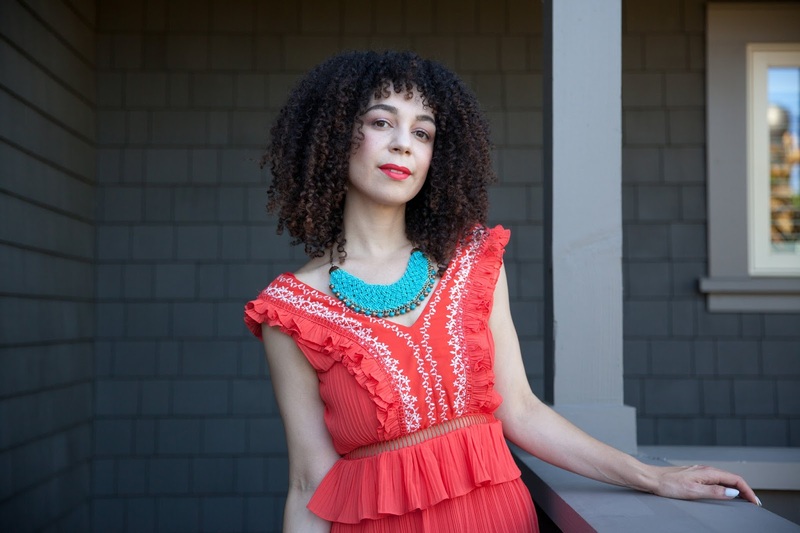 I was recently invited to give the Moroccanoil Curl Collection a try, and I was thrilled. 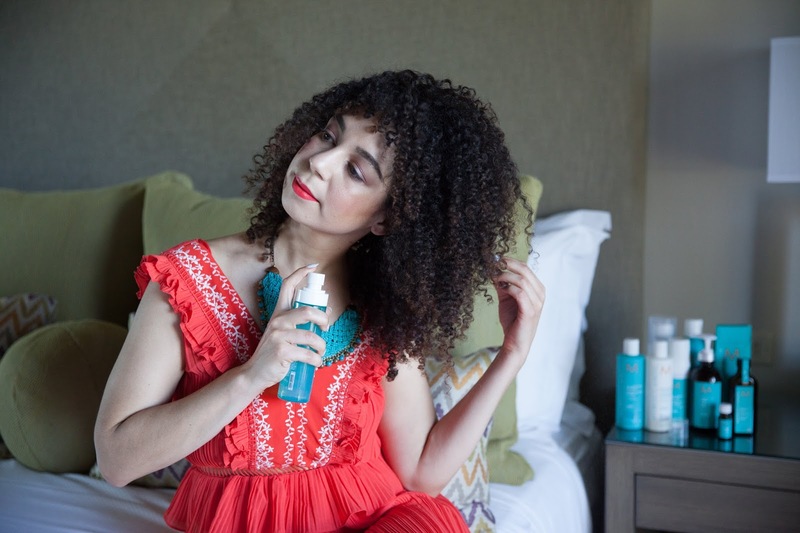 I am no stranger to the original holy-grail, award winning Moroccanoil Treatment, and it has been a staple in my hair regimen for some time; so I was excited to test out the entire Curl line! When it comes to my curls I love big, full volume hair. I specifically ask for my curls to be shaped into several layers to maximize their volume. In the past I have learned to shy away from the use of heavier oils for my hair as they tend to cause a lot of curl clumping (which, admittedly is not necessarily a bad thing! ), and weigh down my curls. With Moroccanoil's argan oil, my thirsty curls are able to receive moisture and vital nutrients such as vitamins and antioxidants that are critical to the health of my hair - while remaining free and bouncy. And when it comes to healthy hair maintenance, more is more! The Moroccanoil Curly Collection is infused with argan oil throughout the entire product offering, which aids in moisturizing brittle, thirsty curls, and gives you envy inducing, healthy shiny curls, without a whole lot of fuss! Continue reading below for my breakdown of the collection contains, and how I use each product. Curl Enhancing Shampoo and Curl Enhancing Conditioner: the Curl Enhancing Shampoo with argan oil is a creamy shampoo that really got my scalp clean, and removed the buildup from my curls. I liked that it wasn't a clear shampoo (a curly girl no-no), and it didn't leave my hair feeling striped - my curls felt clean and moisturized. The Curl Enhancing Conditioner didn't have as much 'slip' as I had anticipated, and my wide toothed comb didn't glide through my curls. However, what truly impressed me was just how incredibly soft my hair felt upon rinsing; it felt soft and smooth, like buttah. A curly girl couldn't ask for more! Curl Cleansing Conditioner: a unique one-step conditioning cleanser that makes washing and conditioning your curls a breeze: it's just one step! Infused with tea tree oil (a key ingredient to a healthy scalp), sunflower oil, argan oil, and vegetable proteins, this one-step cleansing conditioner surprised me with it's ability to de-tangle curls. I really liked the unique foam-like consistency, scent, and how incredibly moisturizing it was. I used about 1 golf ball sized portion to evenly coat and saturate my damp hair, and de-tangled with a wide toothed comb, making sure to massage my scalp, and add water while gently working it through to my ends. I will be packing this for travel, as it reduces the products I need to pack! Intense Curl Cream: this is a fantastic leave-in conditioner. A weightier curl product, this is great for high porosity hair, taming flyaways, and clumping the ends of your curls. For lower porosity hair (such as mine) this could easily be a one-step styler, resulting in large, fluffy, and defined coils that give me that desired 2nd day curl look. My curls were left soft and defined, with lots of shine. It layers wonderfully on the ends, keeping them moisturized and tamed, and also gives my curls a bit of stretch, which I greatly appreciate. Curl Defining Cream: I have become a die-hard fan of this curl defining cream. It's lightweight, works through my curls effortlessly, and the scent is divine. Infused with argon oil and heat-activated technology, this product gives my curls a beautiful shine. My curls are bouncy, healthy and stunning with this product. A little goes a long way, and I am able to get a nice even coat of product with 5 pumps. Curl Control Mousse: a creamy, silky, and argon oil infused mousse, I this is my top favorite out of the entire line. I have always preferred mousse over hair gel, and this product is oh so milky smooth. Unlike traditional alcohol-ridden mousses, this Curl Control Mousse is moisturizing, and leaves my curls incredibly soft and touchable, while defining my coils and maintaining their shape all day long. I absolutely love it! Curl Re-Energizing Spray: It seems that no matter how high the pineapple, my curls still need a little help in the AM to spring them back to life. The Moroccanoil Curl Re-Energizing spray springs my curls back to life, and reactivates their bounce. I have also found that by tilting my head forward and spritzing this at the roots gives my curls extra lift and volume; bonus!! The green tea, argan oil, and aloe all contribute to extra moisture and shine. Step 1: In the shower I saturate my curls, making sure they are dripping wet. Using about a quarter size amount of the Curl Enhancing Shampoo, I focus on the crown of my scalp, and the center of my head (the ponytail spot). I work the shampoo all across my head, letting the suds work their way to my ends. Rinse. Using about 2-3 golf ball size amounts of conditioner, I work the product evenly from root to tip, detangling with a wide tooth comb, and finger spiral my curls to 'train' them to hold their shape. I then tuck my curls into a shower cap, and let the conditioner sit until I'm ready to get out, and rinse out the conditioner last. Step 2: With dripping wet hair, I divide my hair into 2 sections, and gently coat my hair with 2 pumps of the Curl Defining Cream onto each section. I then split the 5th pump between my roots, and the troublesome back section of my hair. Step 3: Curl Defining Cream applied, I then take a dime-sized amount of the Moroccanoil Treatment and coat my strains, paying attention to the ends, and the very top of my roots. Next, I apply 2-3 pumps of the Intense Curl Cream to my ends, and focus specifically on the troublesome back section of my hair. Step 4: Lastly I apply the Curl Control Mousse, using about 6 pumps total, working it into my roots, and coating my curls from root to tip. I then scrunch the product repeatedly until my strands are evenly coated. I then 'plop' my curls in an old t-shirt for 20-60 minutes, depending on how much time I have and finish with a quick defusing session if needed. The result: beautiful, moisturized, and healthy shiny curls! I refresh my curls with Curl Re-Energizer as needed, and reapply the Treatment daily between washings. 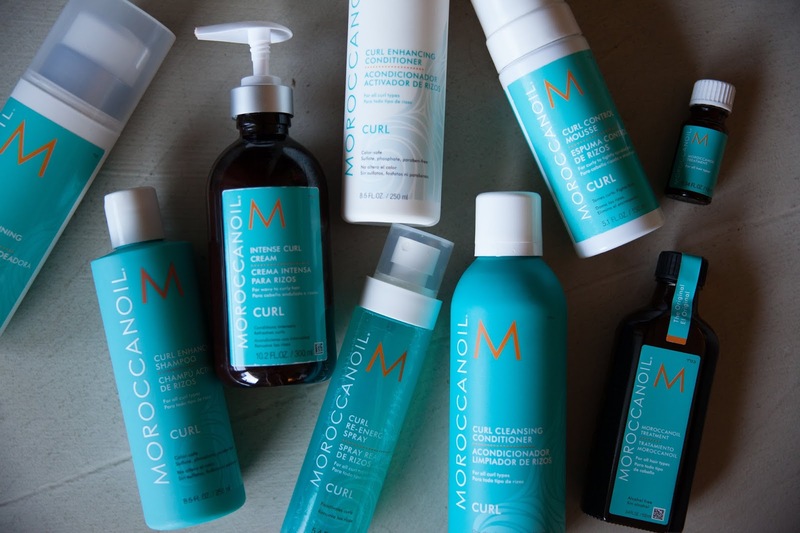 Have you tried the Moroccanoil Curl Collection? Did you know that they had one? As a dedicated user of their Treatment Oil, I have to say that I am thoroughly impressed with this collection. 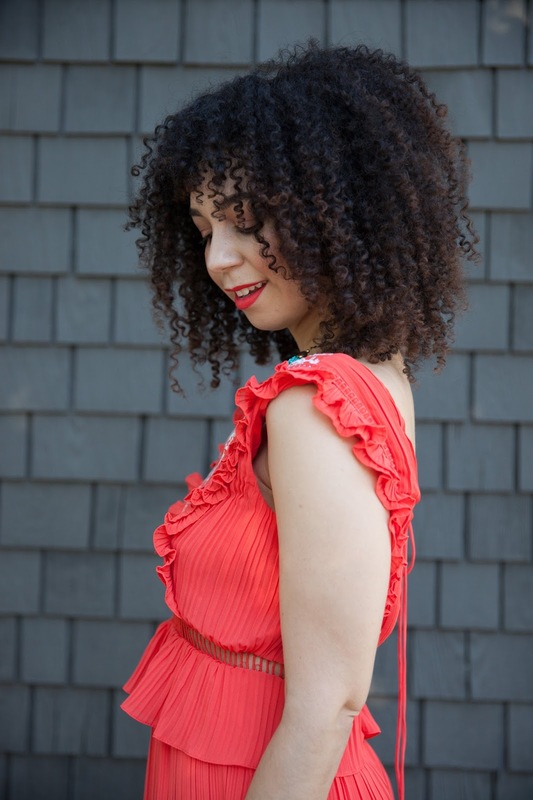 My curls are soft, defined, and give my hair the volume I crave, and with definition too! To review the entire collection, along with further tips, tricks, and to see their suggested Curl Regimen, click here. This post was sponsored by Moroccanoil. However all photos, opinions, and review are my own, and are a true representative of my thoughts, and feelings towards this product. If you have any questions about my review process, or the products and brands I selectively choose to work with, please do not hesitate to ask!